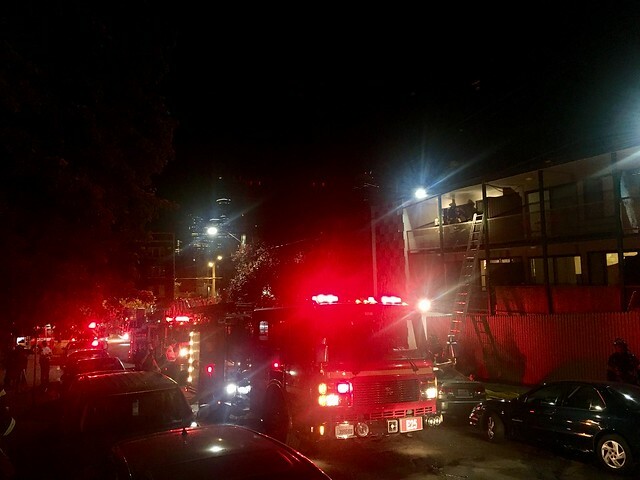 Seattle Fire crews had their hands full as they battled flames in a unit crowded with possessions and debris on the third floor a Summit Ave apartment building early Thursday morning. Flames were shooting from the third floor of the Olive Crest building and smoke filled the nearby streets as firefighters first arrived at the scene around 1:19 AM. As they accessed the unit, they found piles of material on fire inside the small unit but nobody inside. The building was cleared of residents during the response though some residents “sheltered in place” due to medical conditions, according to Seattle Fire radio. Crews brought the fire under control but were still dealing with smoldering debris inside the unit as the Fire Marshal was called to the scene to investigate a cause. A Wednesday afternoon fire along the west side of I-5 near the Pine overpass forced the street’s closure due to the large amount of smoke coming off the smoldering blaze. Seattle Fire responded to the area just after 3 PM and found more than 300 square feet of possessions, debris, and refuse on fire next to the freeway. A fence erected to deter homeless camping in the area slowed the response, a SFD spokesperson said. There were no injuries. The cause of the fire was not determined. This entry was posted in News, etc. and tagged fire, powhat, summit by jseattle. Bookmark the permalink.